Bahrain has recently launched an international “religious tolerance” campaign that’s included a range of PR moves, such as the king publishing op-eds in US newspapers and sending his son, Royal Guard Commander Sheikh Nasser Al Khalifa, to the Simon Wiesenthal Center’s Museum of Tolerance in Los Angeles to formally launch the new “Bahrain Declaration of Religious Tolerance” and associated “King Hamad Global Centre for Interfaith Dialogue and Peaceful Coexistence.” The campaign seeks to portray Bahrain as a leading force for protecting religious freedom and combating violent extremism in the region. However, it’s main emissary, Sheikh Nasser, is directly accused of torturing protesters who’ve called for an end to sectarian discrimination in Bahrain (with the UK even quashing his diplomatic immunity), and also served in the Saudi-led coalition operation in Yemen, which is accused of war crimes. 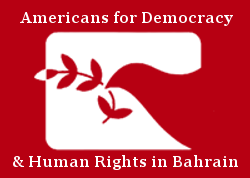 ADHRB’s Executive Director Husain Abdulla published an op-ed in openDemocracy on 29 November explaining how Bahrain is using these actions to divert attention from the kingdom’s systematic discrimination against the majority Shia Muslim population and launder the reputation of royals accused of abuse. In particular, the piece highlights Sheikh Nasser’s role in human rights abuses in the aftermath of the Arab Spring and the US State Department’s condemnation of Bahrain’s systematic discrimination against the country’s Shia population.